It is the highest building in South America and ironically it is located in Chile, a country with 500+ earthquakes a year. Costanera Center is truly an architecture beauty. Just look at it. Costanera Center is 980 ft. (300m) tall. 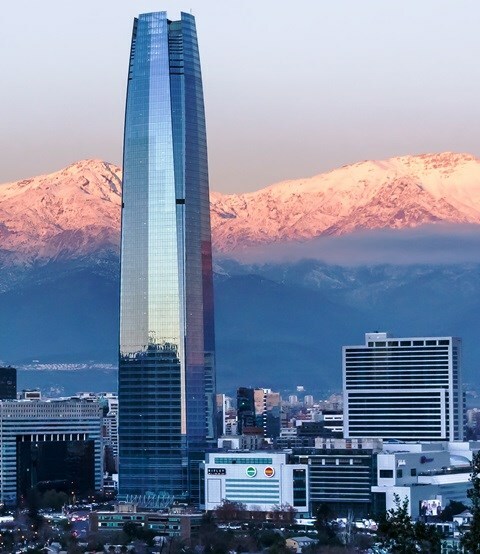 Costanera Center or Grand Torre Santiago is used for two purposes: business and commercial purposes. It has a six-floor shopping mall, which, by the way, already had Christmas tree days before Thanksgiving, and view point on the top. The construction ended on February 14, 2012, and it was designed by Cesar Pelli. Besides it being the highest building in the Latin America, it is the second highest building in southern hemisphere, behind tower called Q1 on the Gold Coast, Australia. Talking about constriction in Chile, many experts and engineers say that Chile one of the best, not the best, country to learn about construction. Chile had 611 earthquakes in the past 365 and the building are undestroyed. The world as well as engineers can truly learn from Chile´s constructions. For example, Chile experience 8.3 earthquake on September 16, 2015 and the buildings were virtually undestroyed. Only 13 people died, 12 on the coast due to Tsunami and 1 in the city because of truly unfortunate event. 200 boats were destroyed, but 0 buildings. That is an impressive number for 8.3 earthquake.